... This tourist town had little appeal to me. Then again, I really just stopped here to grab a bite to eat. And this beach bar seemed to be the perfect spot. I hadn't had breakfast, but fish tacos was what I really wanted. 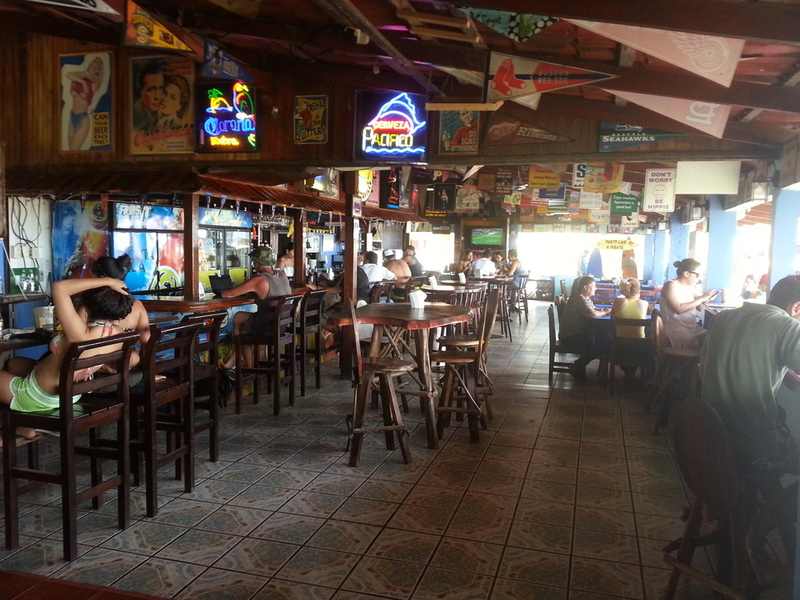 I was 20 minutes too early for lunch, so I hung around, had a beer and chatted with another gringo at the bar. Actually, a small group of Harley riders made this bar a stop as well, but I didn't get to chat with them. 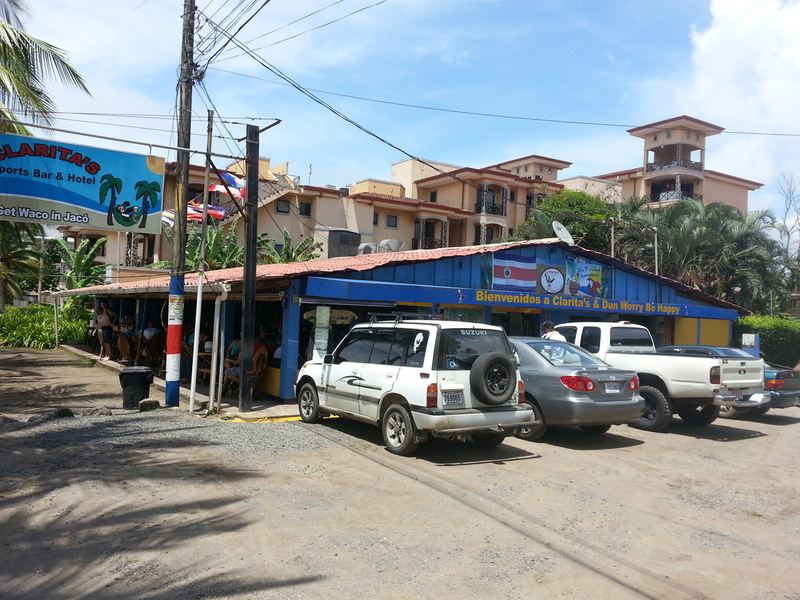 Then, I headed to a smaller town called Quepos for a short stop. Quepos is about 1 km off Hwy 34, right on the ocean and known for Manual Antonio beach, a nice stretch of sand famous for snorkeling and kayaking. I had visited this place many years before with my son , Dominic, when he was little. I faintly remembered the place. As soon as I hit the main road again heading south, it started to rain. Hard. I got to know that pattern real well, light at first then it was pouring for a good 30 minutes and after that for an hour or longer, steady rain. Usually around early afternoon. I had kept my rain gear handy, and now it was that time again. Turn off the road, park the bike, open pannier, pull pouch with rain gear from pannier, put on rain over pants (which are meant as a rain "liner", but I put them over my actual riding pants and then they fall down when I stand up, because nowhere to zip them to), slip over the rain jacket (meant as a "liner"), put away pouch, close pannier, sit on now wet seat, after putting on wet helmet with wet gloves. I decided only to discontinue riding when it's really pouring hard, and I am unable to see the road in front of me through my fogged up visor. Otherwise, it's keep riding south, Charley. Once I am wet, I am wet. So why stop, right? Camping was now definitely out of the question. Had to find something soon, because wet and dark don't mix well. Ended up walking to the supermarket (made pasta and sauce on my butane cooker), went swimming, laid in the sand, then got rained out and walked uphill to a bank a kilometer away the next morning, because the host couldn't make change for a 100 dollar bill. But first, I "brewed" myself a nice cup of instant coffee on my little burner. Ahhh...life is good.